This luxurious Island Pointe Condominium is located in beautiful Merritt Island, Florida, on the banks of the Indian River intracoastal waterway just 6 miles from famous Space Coast beaches and an hour from Orlando’s entertainment and theme parks. Built in 2005-2006, Island Pointe is a gated community consisting of four waterfront residential buildings with a separate clubhouse. There are 185 large residential units with diverse 3 bedroom/2 bath floor plans and square footage ranging from 1,800 up to 3,200 square feet. All units have a one car enclosed private garage. There is plenty of other undercover and street side parking for families with two vehicles, or for guests. The first floor of each residential building has a secured entrance to each building lobby and private garage parking. 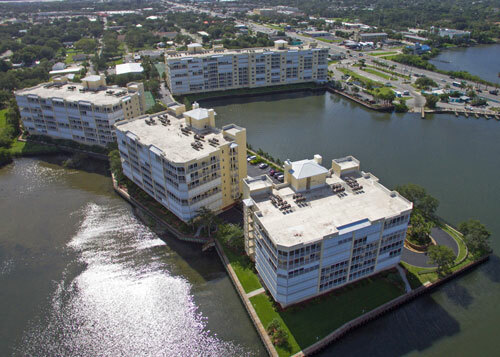 Each unit has large balconies and provides fabulous views of the Intercoastal waterway. Sit on your balcony and watch the sunsets, or just watch the sailboats and other watercraft boating on the river along with a diverse community of waterfowl, dolphins, manatees and fish. Island Pointe Condominium offers amenities galore. There is a large recently redecorated clubhouse, kitchen and party room, an exercise room, sauna, two pools with hot tubs, three tennis courts, a pickle ball court, and two basketball courts. A seawall surrounds the waterfront area with a boardwalk along much of the perimeter suitable for walking. Often, residents can be seen kayaking or paddle boarding nearby in the Indian River, launching from the Island Pointe stairs that go from the boardwalk to the river. Why only vacation at the Space Coast when you can live here? Island Pointe Condominium. A world apart. Check out gas prices in the area!